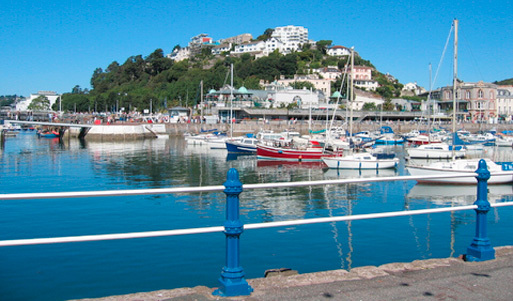 Torquay is a town in the district of Torbay, in county Devon on England's south-west coast. It's called the English Riviera because of its long beaches, palm trees and a fairly warm climate. It has a lively marina for private boats, good shopping and restaurants. You can watch the beautiful scenery from steam trains, or the sea from a yacht. The gay scene is quite big, considering it's such a small town. the venues are on the small alleyways in the city centre. This is where author Agatha Christie was born and where Fawlty Towers was filmed.